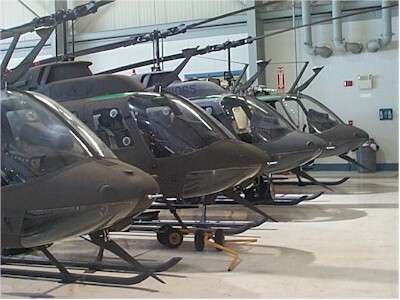 These are the OH-58 "Kiowa" helicopters, used for drug enforcement activities. The spiny things sticking out of the front of each aircraft is a line cutter. If the helicopter flies into a wire or cable, these things will cut it so the aircraft won't get tangled up in it.